Stamina is one of the most important physical characteristics in the sport of hockey. Outstanding endurance is a characteristic required of any hockey player, no matter the age or skill level. Despite only being on the ice for short periods of time, hockey players push their bodies to the limit as they race across the rink while remaining attentive to the puck, attacking and defending. As a result, a common question arises: How do you increase your stamina for hockey? Training stamina in hockey is all about mimicking the conditions that your body will go through in an actual game. If you get your body used to short bouts of expending energy and aggressive movement, then you’ll be able to play an entire hour-long hockey game without wearing out, no problem. Typically, the average shift in a hockey game is 45 seconds, and a fair estimate for the total amount of ice time a player will get is 20 minutes. Therefore, a player can have upwards of 20 shifts per game! The key to preparing for this? Interval training. Interval training just means switching between two activities which require different rates of speed and degrees of effort. The cool thing about interval training for hockey players is that it can be done both on the ice and off the ice. Remember: For any form of training, including those mentioned below, always remember to warm up and stretch your muscles beforehand to prevent injury! An excellent example of on-ice interval training is doing laps of the rink. You can skate either the length or perimeter of the rink as fast and as hard as you can, and then take a couple of slow recovery laps. The sprint-lap mimics your shift during a hockey game, and the recovery laps mimic the time you would be sitting on the bench. You can also combine this sort of training with an aspect of stick handling or shooting to turn it into a drill. For example, you could start at one end of the ice with a puck, sprint around a cone and shoot at the far net when you approach close enough. This can be repeated any number of times you’re comfortable with. There are all kinds of on-ice drills available online that involve aspects of interval training for increasing stamina. 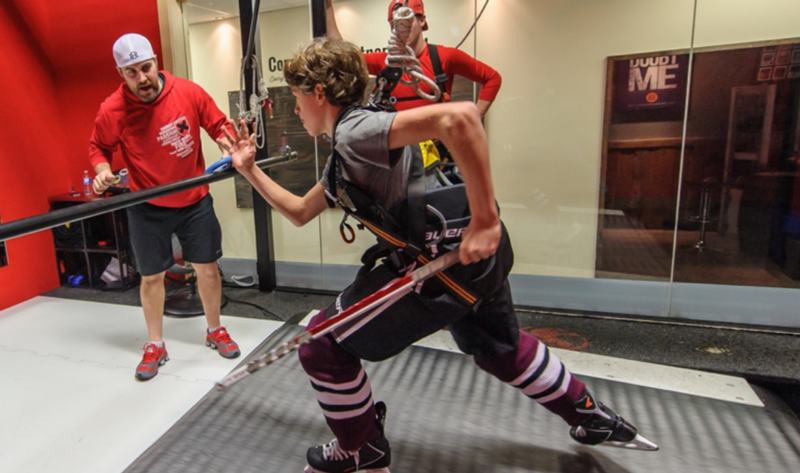 The key to off-ice interval training is precisely the same: exercises where you have short bouts of high energy and aggressive movement followed by a recovery period. The simplest off-ice interval training exercise is running, whether on a treadmill or outside. You would sprint at high-intensity for about half a minute and then jog slowly or walk for a couple of minutes to recover. However, running certainly isn’t the only exercise that accomplishes increasing endurance. You can do half a minute of burpees with a minute of recovery, or half a minute of high-intensity cycling on a stationary bike with a couple minutes of slow-pedaling as a rest period; the possibilities are endless. Any sort of circuit where you’re switching between exercises is great as well. For example, you can do 30 seconds of one-legged alternating squats with a 30 second rest, then 30 seconds of crunches with a 30 second rest, then 30 seconds of push-ups with a 30 second rest, etc. Feel free to personalize and balance your circuit exercises however you like, so long as you’re following the same formula for stamina success: high-intensity, then recovery period. Interval training can and should be done both during the on-season and the off-season. Of course, the off-ice interval training would be utilized way more in the off-season when ice usually isn’t available. If you strive to stay in shape and apply interval training year-round, you’ll soon find that you’ll be able to carry the same amount of energy and effort through an entire 60 – 90 second shift on the ice, and through every shift of an hour-long hockey game. This can put you miles ahead of your opponents on the ice who will tire out quickly. In turn, you can exploit that weakness and create an opportunity for your team to score! So, building your hockey stamina using interval training may just be the difference between winning or losing a game.